Papa Bear & I purged all of the plastic from our kitchen almost 2 years ago. Anything plastic that could be eaten from or have food prepped/stored in was ditched – everything, that is, except for ziplocs. I really dragged my feet on banning those because they are just so dang convenient, and unlike the 95% of other plastics that are known to leach toxins & disrupt hormones, ziplocs have not been found to carry those same threats (source). Ziplocs are a “safer” plastic. Plastics that contain BPA (& other estrogenic activity) can leach into food & drinks, spilling toxins and hormone disrupters into our bodies. Ziplocs are plastic. Ziplocs are bpa free. So they must be bad, right? Wrong. The hype around BPA and other bisphenols refers to plastic types that are aromatic-derived. Ziplocs, on the other hand are aliphatic, derived from ethylene. Aliphatic plastics do not contain EA’s (unless some funky additive is thrown in). Though 95% of the plastics we handle day-to-day have been found to leach estrogenic activity, Ziplocs are among the 5% of “safe” plastics that we encounter. Out of 33 types of food bags tested, only 2 were found to contain EA’s. The brand names of the 2 failed samples were unnamed, but as the estrogenic activity is likely due to additives (as previously mentioned) or manufacturing processes, reputable brands such as Ziploc or Glad should not pose major concern. I’d probably advise steering clear of a random “budget” brand you find in discount stores though, just to be safe. So, what gives? If they are convenient and reportedly safe, why have we finally given Ziplocs the boot? Meant for single-use. Yes, there are people like my mom (thank you for the good example!) who wash & reuse ziplocs. But I am not one of them. 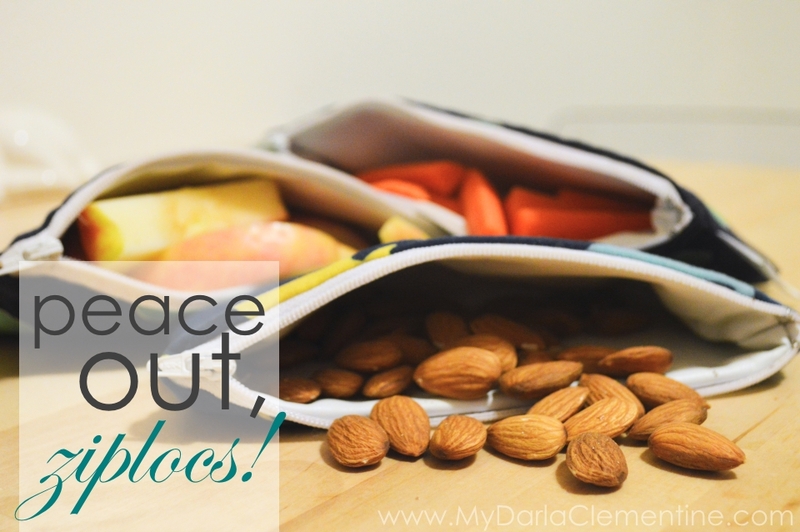 So, every time I packed a lunch for Papa Bear to take to work or grabbed snacks on the go for my girls, I was creating waste. Non-biodegradable. Micro-organisms don’t see polyethylene as food, so plastic bags just won’t ever biodegrade. The sun, however, will eventually photodegrade them and cause polymer chains to break down, but scientists can only estimate how long this process will take. I’ve seen estimates from 100 years to 1,000! Either way, I think we could agree that I will turn to dust before my discarded ziplocs do. They cost money. There is always a financial catch with single-use convenience items; in order to keep stocked you will continually need to purchase new ones. Sure, price per bag may not be all that high, but if I’m making deodorant at home to save money then there is no way I’m throwing down $15 for a box of plastic baggies at Costco, plain and simple. And now we say hello. When dropping a convenience item, it’s always helpful to have something practical to replace it with. For snacks and packed lunches: We bought reusable cloth “ziploc” bags on Amazon (also available in sandwich size) that have worked out perfectly for us! Cleaning is a cinch; we just rinse out the inside, or throw in the washing machine if needed. For freezing: We have completely moved over to mason jars for smaller items and liquids (you can read about our switch here). As far as larger items go, I found these airtight, reusable zip bags made of silicone and love them. They are a great non-plastic option since silicone has been proven safe for food use at low temperatures. For food storage: Yep, mason jars again. It’s been a few months now since we have had ziplocs around, and honestly, like most things we have so far replaced, I don’t miss them at all. Life went on, we adjusted, & I’m proud to say that this small choice will make a big difference over time in reducing waste & cutting costs. Here here. What about freezing things like waffles and pancakes? I make up a couple batches and put them in the freezer for quick school morning breakfasts. Those won’t fit in a mason jar. I agree, freezer storage options can be tricky. I found these silicone bags online and ordered some for myself! They seem like a great option as they are airtight, reusable, and made of silicone (which we know to be safe at low & freezing temperatures).